From Wednesday 11th until Sunday 22th of May, Cannes attracts most of the largest and beautiful yachts in the world for its annual Film Festival. Even if the beginning of the Spring is still uncertain in terms of the weather, this international event is once again one of the largest superyacht meetings in the world. With parties organised on board or simply owners curious to discover the Festival, yachts are moored all along the coast between the bay of Cannes, the Lerins islands, the Cap d'Antibes with its famous Eden Roc hotel and Antibes close by. This year, many US owners came with recently launched or purchased superyachts, like Pelorus, Cakewalk or Seven Seas. Some usual visitors are there too like Octopus, Lady Moura and Luna. Some neighbours also decided to cruise for the event including RM Elegant, Sunrays, Alfa Nero, Lady Anne and Natita. Also smaller yachts like the recently launched Shooting Star appeared in Cannes, a few days after her debut in Monaco. As a reminder, Shooting Star is featured in our 300th issue of Boat International, now available on sale. 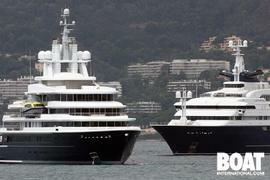 Only the new largest yacht is missing at the event, Eclipse being currently moored in Barcelona. The Festival will continue over the week and will be followed by the 69th Formula One Grand Prix of Monaco. We should expect more surprises then. Discover most of these yachts yachts listed in our top 200 largest yachts.